Before I write any new article, I take the time to make sure it is an article that I believe God would approve of me writing. For instance, my article “Aliens Revealed: My True Story”, there is NO QUESTION that God wants the truth out about what is really going on. I’ve used the word “compelled” to describe how I’ve felt since learning the truth about this satanic deception. The word “compelled” just barely does it any justice as to how I’ve felt. Another description may be a “burning desire” to get this message out. This isn’t about me. I’ve been trying to humble myself that God has chosen me to help get this message out. There is temptation to take something like this and run away with it believing that it’s something I had done. There is a real temptation there for a person to think they are something special, when all they are doing is their job-serving the Lord. I give ALL of the credit to the Lord. Last night, I had a thought that put it all into perspective. I think it was God showing me how to deal with the responsibility He has given me (and others). I believe the message was that sometimes I have been seeking to please people. I had lost some perspective; that it’s not about pleasing people. It’s simply about serving God and doing one’s duty. Basically, I shouldn’t put the attention to what people think first. I need to put it all into perspective and realize that it is God whom I serve. I give ALL thanks and praise to God for showing me the truth and to Jesus for saving me by shedding His precious blood. With all this being said, I believe that I have been urged to write this article. I’ve ignored writing this several times. When the “thought” keeps coming over and over again, that’s a good hint to me that God is urging me to write about this particular topic: The Rapture. First, I need to start off with the message that I received from God regarding the Rapture. Recently, I’d confided the message I had received about the Rapture and some of my experiences to a friend; who also happens to be a fellow Christian. At this point, I’ve only told a select group of people whom I believe will not think I’ve gone completely INSANE. I can tell you, it’s not easy telling someone that God gave you a message concerning the End Times that He wants you to get out there so that others will not be deceived. Its one thing telling complete strangers and it’s another thing telling close friends and family. I was hurt, but not offended. I can understand from his point of view how crazy this must all sound. He also stated that I must have been going through some kind of crisis at the time and “imagined” all of these things. I replied, “For 3 months?! For three months I imagined filming these demonic beings? And if I was delusional, what about all the people who saw these evil beings in my footage and left comments? !” Those people must have been delusional too. He said once again that he did not believe me. The conversation ended with me saying, “With what I have told you, either I’m an absolute complete liar, or I’m telling you the truth.” It was weird having someone that close not believing me. It hurt. But I would be lying if I said these things DIDN’T happen. To his credit, it has not affected our friendship. I just will not bring it up again. The bottom line is that YOU don’t have to believe me. The Rapture is Biblical. I know that I am serving the Lord, and that is what matters to me. However, I will testify that I would not dare make something like this up – the message I received is true. One thing that I’ve come to realize is that even though a message is received; it doesn’t answer all of the questions. Let’s just say for sake of argument, that you completely believe me and that this message is indeed a message from God. Let’s analyze this statement by breaking it down. It really was a very short and to the point. I would also like to add, that any speculation on my part is merely – you guessed it – SPECULATION. If God wanted to tell me more, He would have! With that being said, from my impressions only, I believe that there are some “educated guesses” that we can take from this brief sentence. 1. There is going to be a Rapture. We know this for sure because it’s clearly stated “…the Rapture to non-believers”. 2. The Saints will be ‘taken’ in the Rapture. We know this for sure because all who are left in the message are “…non-believers”. The Saints will be gone (“caught up” into the air with Jesus) because they were true believers IN CHRIST BEFORE the Rapture occurred. 3. 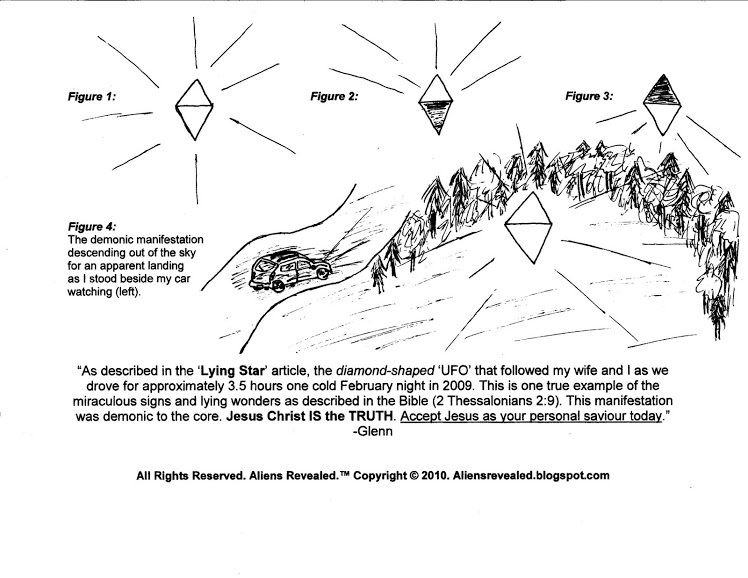 The Alien/UFO “phenomenon” will be a False Explanation for the Rapture. We know this for certain because the sentence states “…will be used to explain…”. 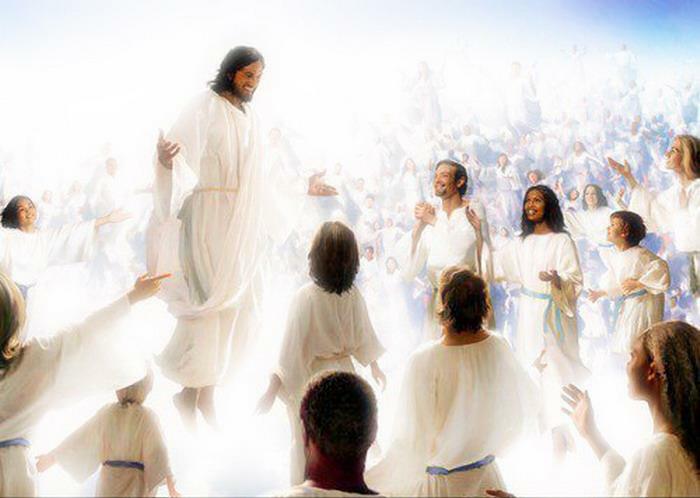 The truth of the Rapture is that it will be done by God. 4.The entire Alien/UFO “phenomenon” is a satanic lie. We know this for sure because it’s being used as a False Explanation. This naturally corresponds with Satan’s character because Satan is THE FATHER OF ALL LIES. There is NO truth in Satan. 5.As we get closer to the Tribulation, there will be more and more signs that the end is near. We can only assume from this message that the “Alien/UFO phenomenon” will only increase – with close to the height of the activity during the time of the Rapture and into the tribulation. Furthermore, Satan DOES NOT KNOW exactly when the Rapture is going to take place. We can also assume that Satan is carefully watching the signs of the coming end as well. Additionally, Satan needs to time these false signs and wonders to match the actual Rapture. It’s very much like a magic trick that uses smoke and mirrors. Satan needs to have the timing set perfectly to match the Rapture and get the most ‘bang for the buck’ out of his deception. 6. Thus, it would be fairly reasonable to assume that when the media begins reporting more and more “Alien/UFO” stories, the Rapture is getting closer. The likelihood of the proximity of the Rapture will increase based on the more the media focuses on this “alien” lie. However, this is based purely on an “educated guess”. Only God knows when the Rapture will occur, and the Rapture can occur at ANYTIME. If some major signs and wonders occur regarding the alien/UFO phenomenon unlike has ever been seen before, we can assume that the Rapture is imminent. For instance, a mass media “Official contact”. 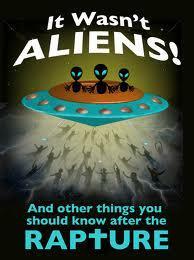 Or even a major GOVERNMENT UFO DISCLOSURE when they will “CONFIRM” that so-called “aliens” exist. I must say again that all of this is pure speculation on my part. God has NOT told me that the Government will confirm the existence of “extra-terrestrials”. However, I DO think this will happen. Why does this increase the likelihood regarding the timing of the Rapture? The answer to that question is by watching the actions of the enemy. Satan is controlling this “Alien/UFO” lie. The Anti-Christ is waiting “in the wings” for the right moment to emerge. Regarding the Anti-Christ, TIMING IS EVERYTHING! 8.We can assume from the message that I received from God that in all likelihood that the Rapture will be Pre-Tribulation. Is it possible to read this as mid-tribulation? It’s possible, but to me the sentence flow seems to indicate Pre- Tribulation. The immediate impression that I got when I received the message was Pre-Tribulation. Again, this is just my opinion. I’ve actually taken quite a bit of “flak” for believing that the Rapture will be Pre-Trib. However, of all the possible timing scenarios for the rapture event, I my opinion I believe it will be before the Tribulation period. “For God hath not appointed us to wrath, but to obtain salvation by our Lord Jesus Christ,” 1 Thessalonians 5:9.